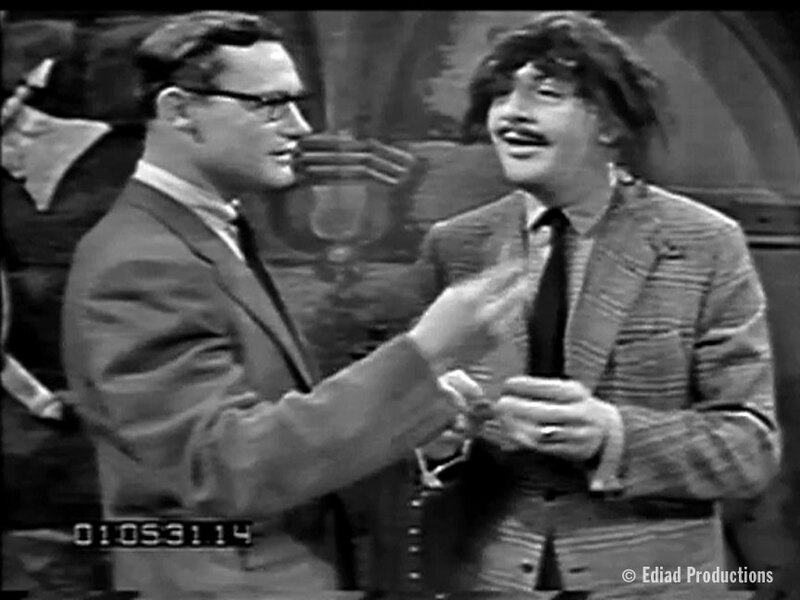 Ernie Kovacs made a point of bringing make-up artist George Fiala out on camera in what may his only TV appearance. It was not to show Fiala off or pay tribute to his craft, but as a reassuring gesture a parent or child educator might do. Ernie’s morning show on NBC that ran from December 1955 to July 1956 aired live from New York from 10:30-11:00am. Ernie was definitely aware that kids would be watching, depending on the time zone or whether or not the show’s kinescopes edition was run on the west coast at the same time slot. From the beginning of the show’s run, Kovacs included daily installments of a puppet show The Kapusta Kid in Outer Space. (“Kapusta” is Hungarian for “cabbage”. Kovacs also did many sketches that involved special make-up, for characters like Charlie Clod (a spoof of Charlie Chan), Rock Mississippi, and Uncle Gruesome. There’s even a musical number in which Edie Adams sings “To Keep My Love Alive” in a ghoulish setting dressed as the Charles Addams character from his cartoons that would — 8 years later — be dubbed Morticia for the Addams Family TV series. What snagged Fiala in my radar was two consecutive episodes of the Kovacs show on April 23 and April 24, 1956. On the April 23 episode, Kovacs appears in a sketch as “Uncle Gruesome”, telling a creepy version of a familiar fairy tale. The segment is on the first Ernie Kovacs Collection DVD set and on the Ernie Kovacs Centennial Edition box set. What struck me was that on the April 24 episode of the Kovacs show, the following day, Ernie mentions that they’d gotten a lot of calls from parents who’d said their kids were regular viewers and had been frightened by Uncle Gruesome, and that he wanted to show and explain to kids that it was really just Ernie and that it was just make-up effects. 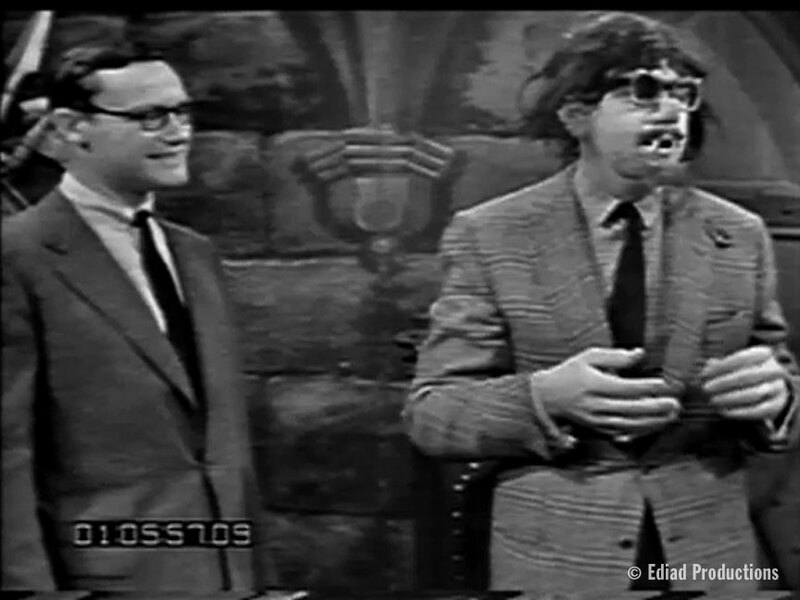 He introduces Fiala, and they demonstrate how the Gruesome make-up worked to transform Ernie into the character. You can see Kovacs was really concerned about the kids who watch the show and how important it was to make sure they understood what was happening on the show. Kovacs also mentions how Fiala has made plaster busts of Ernie and Edie to prepare makeup on. Fiala and Kovacs remove the make-up, showing kids watching at home it’s just Ernie underneath. I’ve found hardly any information on George Fiala online. Fiala’s credits on IMDb are slimmer, and the only TV work of his mentioned is for 1955 episodes of You Are There (CBS). Interestingly, though, his movie credits include The Brain That Wouldn’t Die (1962), the infamous Santa Claus Conquers the Martians (1964), and the Soupy Sales comedy Birds Do It (1966). I wish there was more information on George Fiala and his work as a make-up artist readily available, and if you know more about him and his work, let me know and I’ll either revise this post or create an additional one as an update. 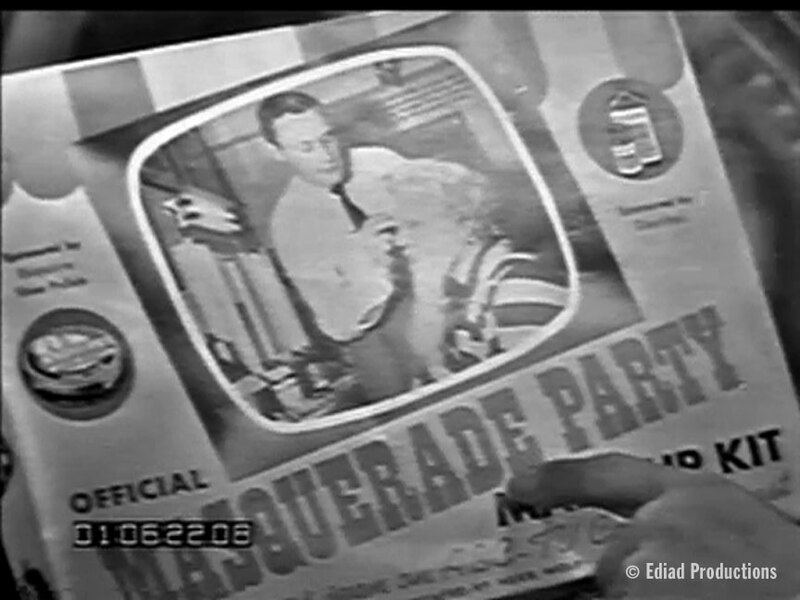 Masquerade Party was one of the other TV shows Fiala did make-up for, and Ernie holds up a copy of the Official Masquerade Party Make-up Kit on the April 24, 1956 episode of the Kovacs show. That was my father. I was allowed to stay up late and watch the credits for masquerade party. Unfortunately not much info other then he also worked on major plays in the early and mid fifties ie My fair Lady. Brett, thanks so much for finding this post and for connecting! I’ll look your Dad up on IBDb and see if any of his theater credits are there. Where is the Hollywood Series?